All of the following Cape Cod Seashore GPS waypoints have been obtained by using a Magellan GPS while kayaking. 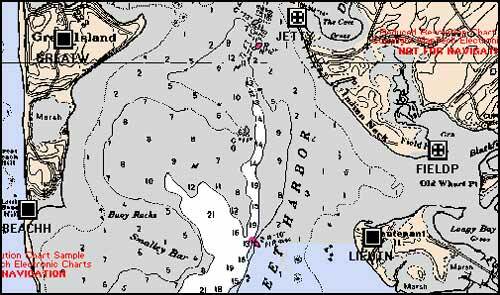 All waypoints are in WGS84 datum and should only be used for recreational purposes and NOT for primary navigation. Always carry a map and a compass with you for primary navigation. The name of each waypoint is 6 characters (the limitation of the GPS unit used). The download file is named capecodgps.zip. This zip file contains a text file named capecodshore.txt. Please read the instructions for your gps software on how to reformat and import the generic text file. A spreadsheet program can be used to reformat the text file, if necessary, for your current gps. Distribution Liability: Outdoor Eyes shall not be held liable for improper or incorrect use of the data described and/or contained herein. These data are not legal documents and are not intended to be used as such. The information contained in these data is dynamic and may change over time. The data are not better than the original sources from which they were derived. It is the responsibility of the data user to use the data appropriately and consistent within the limitations of geospatial data in general and these data in particular. Outdoor Eyes gives no warranty, expressed or implied, as to the accuracy, reliability, or completeness of these data. It is strongly recommended that these data are directly acquired from Outdoor Eyes and not indirectly through other sources which may have changed the data in some way. Although these data have been processed successfully on several different Global Positioning Systems (GPS) units, no warranty expressed or implied is made regarding the utility of the data on other units or systems for general or scientific purposes, nor shall the act of distribution to the public or other agencies constitute any such warranty. This disclaimer applies both to individual use of the data and aggregate use with other data. Downloading these data signifies acceptance of the data "as is." Outdoor Eyes shall not be responsible for errors or omissions in the data, and shall not be obligated to provide updates, additions, corrections, or technical support for this data in the future. Please DO NOT send any email questions to Outdoor Eyes regarding the installation or use of any gps waypoints. Please click "I Agree" if you agree to the terms of this agreement and would like to download the Cape Cod GPS waypoint file.